Tier 1 companies in the global fine pixel pitch LED displays market, namely Leyard, Unilumin, SiliconCore, Christie, NEC Display Solutions, and Daktronics, have a strong global presence with high penetration in the market. Transparency Market Research has observed that these companies have established strong brand names in the business of fine pixel pitch LED display solutions. China-based Leyard Optoelectronic Co., Ltd., the leading player in the global market by revenue, has been concentrating on increasing its global presence through strategic mergers and acquisitions. In 2015, the company acquired Glux Led Creative-Tech and Planar Systems, Inc. The revenue generated by the global fine pixel pitch LED displays market is projected to reach US$3.1 bn by 2024, rising from US$677.1 mn in 2015. The market is expected to register a 15.8% CAGR from 2014 to 2024. Based on type, the segment of up to 3mm pixel pitch LED displays is expected to value US$1,658.0 mn by the end of the forecast period, expanding at a double-digit CAGR between 2016 and 2024. Asia Pacific accounted for around 59% of the total global fine pixel pitch LED displays market in 2015, emerging as the leading regional segment. The markets in the Middle East and Africa (MEA) and Latin America are likely to present potential opportunities for fine pixel pitch LED displays in the coming years. 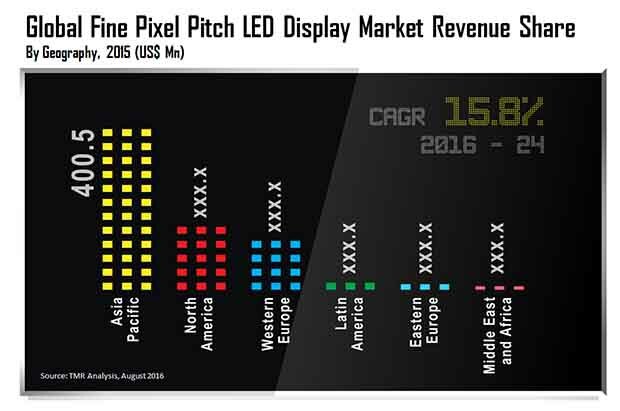 The fine pixel pitch LED displays market in MEA is projected to expand at a CAGR of 28.9% during the forecast period. Considering the sales channels for fine pixel pitch LED displays, e-commerce websites are likely to observe high demand in the coming years due to the spread of internet services across the world. Digital signage and visualization and simulation applications were the potential application areas for fine pixel pitch LED displays in 2015. However, control rooms and monitoring applications are anticipated to register high growth during the forecast period. The growth of the video wall market in recent years has had a considerable impact on the fine pixel pitch LED displays market. Video walls are used in various industry verticals such as sports stadiums, retail stores, and restaurants. “Considering the high scalability, power efficiency, and quality resolution display, fine pixel pitch LED displays have gained popularity in video walls applications,” the lead analyst states. Recognizing the potential of these displays, a number of companies have launched new products to gain a competitive edge. For instance, Leyard and Planar launched the Leyard-TWA series of fine pitch LED video walls in June 2016. The fine pixel pitch LED displays market is also fueled by the high flexibility offered by the products and the declining cost of the technology. On the flip side, the widespread adoption of fine pixel pitch LED displays is challenged by their high initial cost. “We have found that small pixel pitch LED displays cost at least three times more compared to other display technologies such as DLP rear projection and LCD,” the author states. However, TMR predicts that the growing competition in the market and continuous research and development in the field is projected to bring down the cost of fine pixel pitch LED displays in the coming years.